This is the one of the most important features of C#. The .NET beginners may not understand the importance of the interfaces exactly, but in the real-time development of .NET applications, the interfaces are used by the Sr. Developers and the Jr. Developers. The "Interfaces" are similar to abstract classes, but having its own features along with having some differences with the abstract classes. 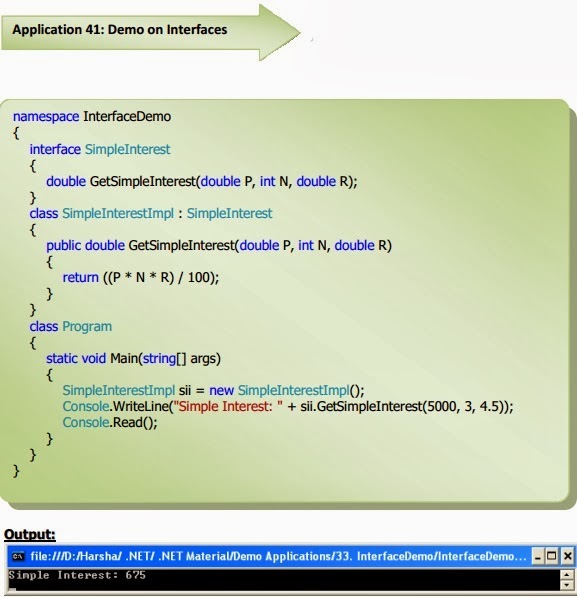 The interface contains only method declarations and can‘t contain method definitions (similar to the abstract methods). The interface can‘t contain any data members but can contain "automatic properties" (Already you know that the automatic property doesn‘t contain definitions for "get" and "set" accessors). Interface methods are by default "public". You can‘t use another access modifier like private and public etc. The interface can‘t be instantiated. That means you can‘t create an object for the interface. The interface can‘t contain constructors. The class that inherits the interface is called as Implementation Class. The implementation class should implement the definitions for all the interface methods. If not, it would generate compile time errors. One interface can be inherited by any no. 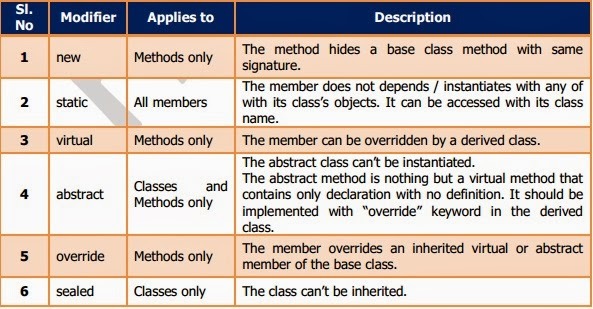 of classes (Hierarchical inheritance). One class can inherit any no. of interfaces (Multiple inheritance). The interface methods can‘t be declared as "virtual" or "static" in the interface definition. The sealed classes are just like normal classes, but you can‘t inherit the sealed class. In other words, you can‘t create a sub class for the sealed class. Trying to inherit the sealed class would cause a compilation error. This is just like "Final classes" in java. class two : one //can‘t inherit this. Will give a compilation error. The abstract method doesn‘t contain method definition; it contains only method declaration as above. The abstract methods can be declared only within abstract classes. A class that is declared with "abstract" keyword is called as "abstract class". If a class contains at least one abstract method, that class should be declared as abstract class. The abstract class can contain abstract methods, non-abstract class and normal data members also. You can‘t create an object for the abstract class. It can be inherited from another non-abstract class. The non-abstract class, that inherits the abstract class, should implement the definition(s) (with "override" keyword) for all of the abstract methods declared in the abstract class. 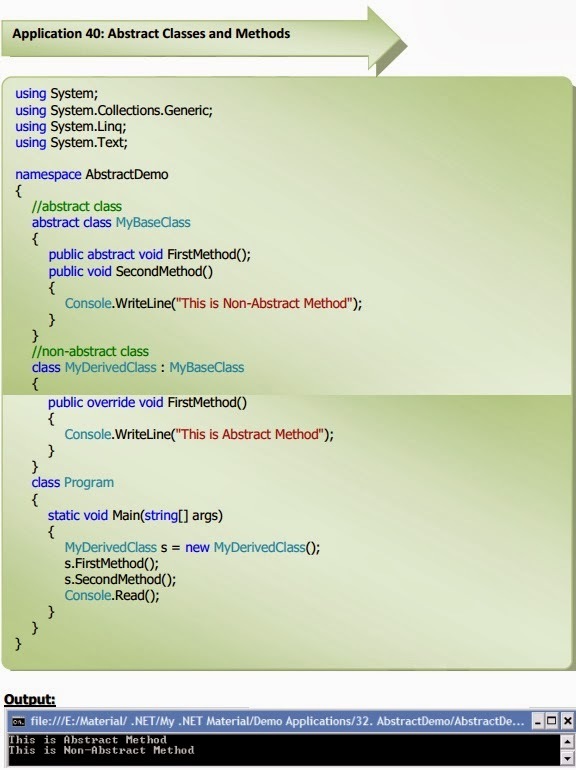 Note: The access modifiers used in the base and derived classes for the abstract methods should be same. Up to now, you learned several modifiers like static, new, virtual, abstract, override, sealed.